OSC (Open Sound Control) is a protocol for sending and receiving information to and from software or hardware. Some electronic musical instruments support it, as well as many software applications. In addition, there are several mobile apps (e.g. OSCemote) that can communicate via OSC over wireless connections. AnalogIn and DigitalIn can receive OSC messages from any OSC compatible software or device, and AnalogOut and DigitalOut can send OSC to any software or device. The IN widgets will read a value after the main OSC string if the string matches what’s specified in oscString. If you want to receive something other than the first value included in the incoming OSC message, set the controllerInputNum parameter to the number of the OSC argument (starting at 0). 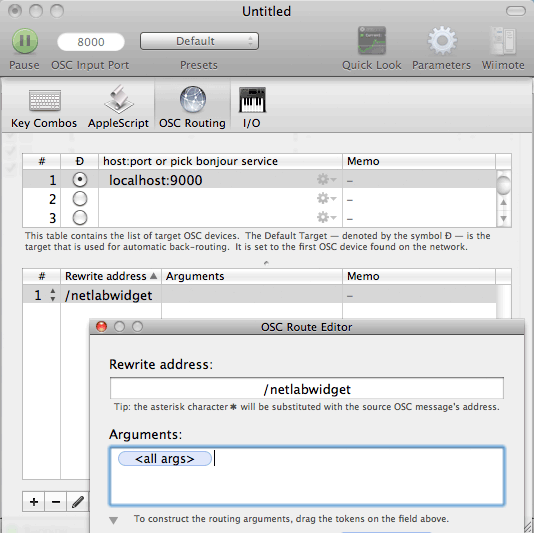 To make the AnalogIn widget communicate correctly with the sender of OSC, you’ll need to know the IP address and Port the device/software is communicating on – which are set in AnalogIn’s controllerIP and controllerPort parameters. You’ll also need to know the IP address where the Hub is running – these will be set in the device/software settings or specified in the manual. If your OSC sender is on the same computer, then use 127.0.0.1, which means the localhost or current computer. For port, a good default to use is 9000. Use the controllerInputNum parameter to select which argument to use. Zero sets it the first value (in this case X=0.1). If controllerInputNum is set to 2, AnalogIn would listen for the third value of Z=0.3. It is also possible to get all values sent to AnalogIn using the multiInput code interface. For more info, see the bottom of the AnalogIn page. In some cases, OSC messages include negative values. Using the OSCemote example again for accelerometer data, the values range from -3 to +3, where 0 is level for that axis. To take full advantage of the positive and negative values (and assuming you have the oscMultiplier set to the default of 1023), you should set ceiling to 3096 and floor to -3096 (i.e. 3 * 1023 and 3 * -1023). The AnalogOut and DigitalOut widgets both support sending a single to any OSC compatible software or device. AnalogOut also can send multiple values using the sendOutput(“23 488 2828”) code interface documented on the AnalogOut page. Set the multiplier to a number that will scale the outgoing values to the receiver’s needs (which are often fractional), such as 0.000977 which will divide the number by 1023. In OSCemote, go to the Settings menu and find out what the Listen IP address is. Type this number in the the parameter controllerIP. The Port used is somewhat arbitrary, but usually 8000 is a good number to use. Type the port you select into the controllerPort parameter. You’ll need to enter similar numbers in the OSCemote app, where the To: IP will be the IP address of your computer. Make the Port on OSCemote the same in both cases, matching what you put into the AnalogIn widget controllerPort parameter.